where my next design inspiration is stolen coming from. The backyard deck is really starting to come together as an actual outdoor room. Last year, after it was installed and painted, I didn’t know what to do with myself on the deck, besides have meals. So that’s all we did. I had a nice loooong winter to think about how I’d really like to use our new space, and what it would take to get us from just a dining area to a more usable space. And after much pondering and thinking and Pinteresting, we concluded there wasn’t really any place to hang out, have iced Arnie Palmers and relax. To remedy that, we splurged on two all-weather wicker chairs with Sunbrella cushions. but once everyone left, and we put the furniture back into every day mode, it seemed to be missing something. I have all the elements needed for a well-functioning deck: a great grill for burning, err cooking, a comfortable dining table & chair set, and a hangout spot with oversized wicker chairs. I wasn’t sure what was missing, but I knew the germ of the idea, once formed, would make sure its presence was known, until it was finally acknowledged as brilliant. And then Friday night, while reading the The Visual Vamp’s blog something compelled me to look at her living room, again. Valorie’s unique method of dealing with awkward windows in her living room. I’ve seen it in person, and its genius. 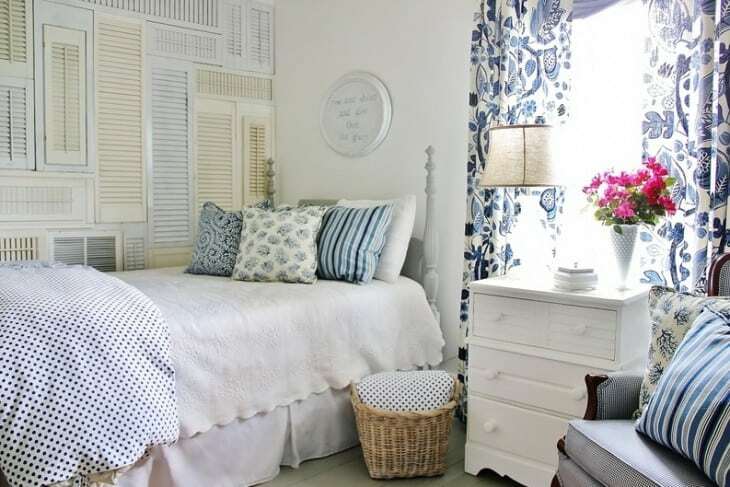 And then I recalled KariAnne of Thistlewood Farm’s use of shutters as a wall covering in a bedroom, and loved the look, and the texture that recycled shutters create. More genius! SHUTTERS! my mind whispered, over and over again. shutters! SH-sh-sh-UTTERS! Shutters! SHUTTERS! S-H-U-T-T-E-R-S! and I had to tell it to shut up. On Father’s Day, I cajoled sweetly convinced, Tim to join me looking for shutters at our favorite local salvage yard, Community Forklift. A quick reminder of what we had Sunday morning. Not bad, but there was something nagging at me, something staring me right in the eye, that I really, REALLY HATED. Commmunity Forklift is great, they have all sorts of modern, vintage, and antique housing salvage materials, and I’ve been known to get lost in their door section for hours on end. After our visit on Sunday, CF is now 4 shutters low. The new seating area after the addition of the shutters. The voices were right, I did need shutters. I’m very happy with the effect, they’re a little chippy, because that’s what salvage and vintage means. Paint the bricks – I can hardly wait to cover that ugly red brick COMPLETELY! Possibly paint the shutters another color – I’m not sure if the yellow will stand the test of time. In addition, I’m on the hunt for something to layer on top of the shutters. Maybe a mirror or some wrought iron scrolls?